I'm updating my CV and biosketch for a few grant applications, and for some time now, NIH has required you to include the PubMed Central ID for each article you publish that arose from NIH support. I only have a dozen or so papers indexed in PubMed, but I still wanted a way to do this automatically. If you have scores of publications, looking up all the PMCIDs could easily become a hassle. First, create an account at My NCBI. Under your bibliography, click "Manage My Bibliography." Then click "Add citation," then in the new window that comes up, select "Citation from PubMed" and hit the "Go To PubMed" button. For many people, simple PubMed author searches suffice, e.g. "Pearson WR[Author]". For some, such name-based searches get it mostly right, but may include a few spurious false hits. For these cases, it's easy enough to exclude those false hits explicitly (e.g. "Mackey AJ"[Author] NOT 9850730[PMID] NOT 10730495[PMID] gets rid of the two AJ Mackey publications that are not, in fact, mine). For others, simple author searches do not suffice at all, but usually adding an institution and/or departmental affiliation does narrow the results sufficiently (e.g. for Jeff Smith, Biochemistry: "Smith JS"[au] AND "University of Virginia"[Affiliation] AND "Biochemistry"[Affiliation] identifies the 16 articles for which Jeff Smith is the senior author; Jeff could also add a few collaborative publications by adding those pubmed IDs to the search, i.e. adding "OR 17482543[PMID]" to the end of his query. The final step is clicking the "Send to" link at the top right, and sending the results of your query to My Bibliography. 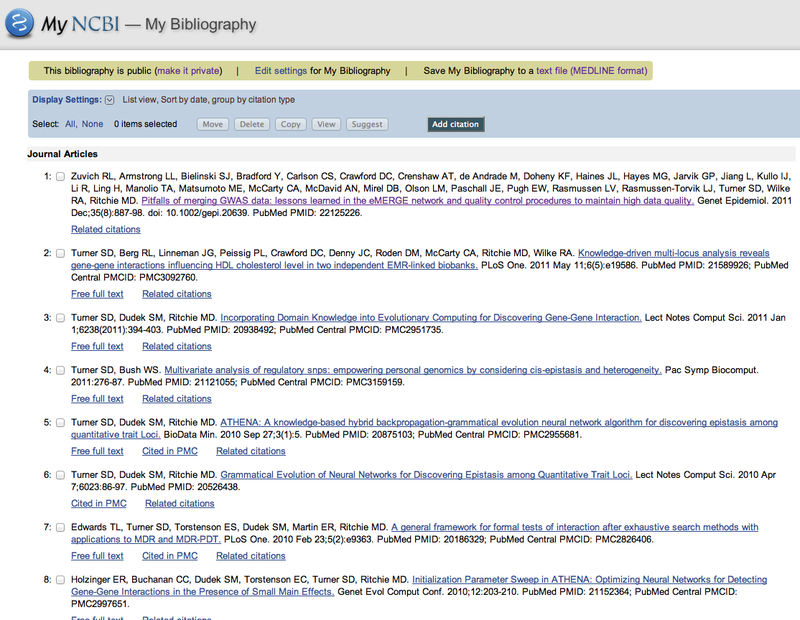 Now, when you are back at My NCBI, you should see a list of all your publications, complete with both the PMID and PMCID, ready to go in your biosketch. You can then export this bibliography as text, or simply copy/paste. 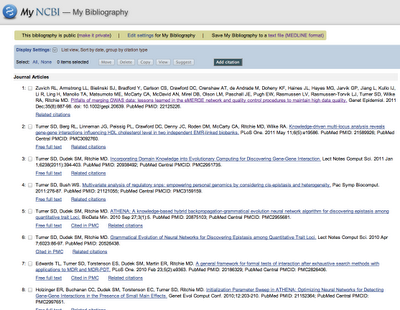 Finally, you have the option of making your bibliography public (example). It doesn't come with the PMID, but another way to get the PMCID in your bibliography is to use the NIH output style in Endnote. Thanks for the postings! Always enjoy your blog. Thanks for the top Erin! I use Mendeley - I bet there's a way to do the same thing in Mendeley (Zotero, others) also. I guess the only issue there would be for papers that had been imported (metadata imported) either before PMC existed, or as soon as the paper was published but before it had a PMC ID. Mendeley uses the metadata that you originally imported - it doesn't go back to the web to see if there's any updated metadata. I wonder what EndNote does.